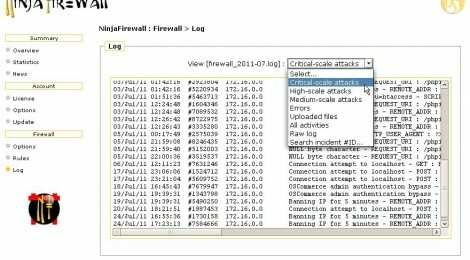 Browse: Home / NinjaFirewall v-1.1.0 released : Powerfull PHP Firewall For WordPress, Joomla and any CMS / PHP apps. [*] better XSS detection (UTF-7 encoding, BBcode etc). [!] fixed an issue where IP:port in Host header was not detected. [!] stats page wasn’t showing the right number of banned IPs (Pro edn). [!] fixed some tiny bugs and typo. NinjaFirewall is a powerful firewall software designed to protect all PHP applications from custom scripts to shopping cart softwares (osCommerce, Magento, VirtueMart etc) and also CMS applications (Joomla, WordPress etc). Specifically designed for shared hosting accounts. Easy to setup; your PHP scripts do not require modifications. Works with any PHP applications, even those encoded with ionCube or ZendGuard. Specific protection for the most popular PHP applications. Stand-alone firewall; will not stop working when you upgrade your shopping cart or CMS software. Hooks and sanitises all requests before they reach your scripts. Protects against remote & local file inclusions, code execution, uploads, MySQL injections, brute-force scanners, XSS and many other threats. Fully configurable with high security advanced options. ← TrueCrack Version 2.0 released : a brute-force password cracker.